SO MUCH YARN, SO LITTLE TIME! : Practical Knitting. I am a process knitter. I love knitting interesting projects, textures and using new techniques. This makes for great knitting....but not necessarily knitting I will wear. I have piles of handknit sweaters. Really, a couple piles. I hardly wear any of them. The things I buy to wear don't match the projects I choose to knit. There is another reason for this tragedy...I keep the heat low in the house and walk around in a tank top all winter. I get really hot in wool...but occasionally I will wear a wool sweater...when chilled. So I have made a decision to not knit anymore sweaters. Really. Why knit them when I won't wear them. I cast on for a sweater. It is so luxurious feeling. It is an open cardigan that I can wear a tank under. It is pretty much all stocking stitch...a pattern I wear! 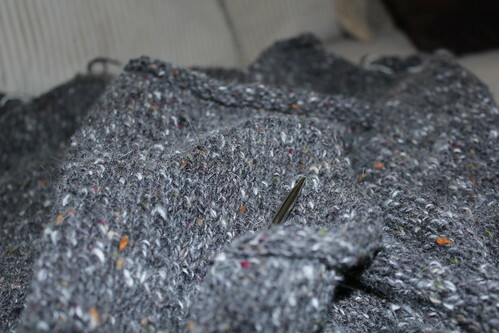 Ok, it doesn't make for the most exciting knitting, but for some reason I am excited about knitting it. I am knitting up a storm. I cast on Friday during the day and am done the body as written! I am going to lengthen it a bit so I am just about done the body. So WHAT am I knitting?!? Well thanks to Michelle, I cast on for the Effortless Cardigan designed by Hannah Fettig. It's gorgeous and practical and surprisingly (or not) I already had it in my favourites! It is the perfect project for my Debbie Bliss luxurious tweed! Well, I shouldn't say perfect because the gauge doesn't match, but by knitting the xs size (while following the lengths for the med) I will get the perfect medium size! So far so good. It is mixed with a little baby drool...well a lot of baby drool...but I am knitting again! Speaking of which, my time is up...he is wailing. Gotta run, more soon! That yarn is so lovely! Look forward to seeing the final product!